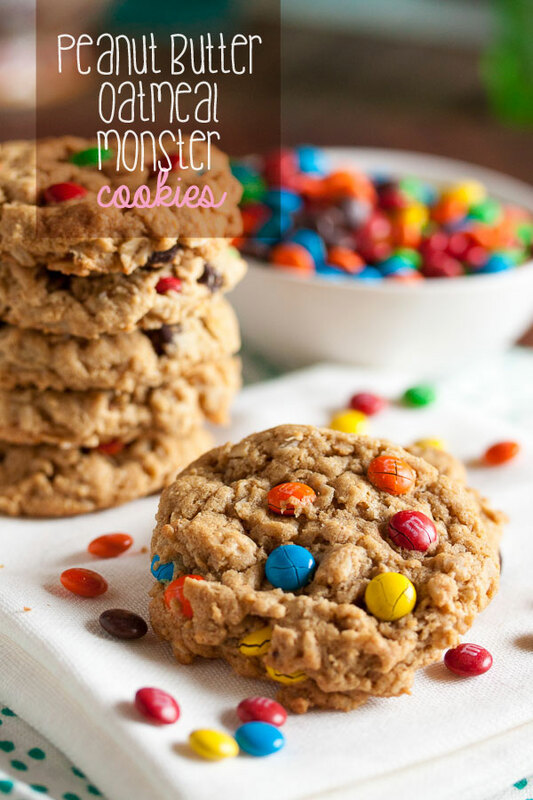 Peanut Butter Oatmeal Monster Cookies | wanna come with? A couple weeks ago when I made the dark chocolate sour cherry cookies, I mentioned that I’d put the recipe I was planning to make on hold to make them – after going out to buy specific ingredients. This? This is that recipe. The original recipe is simply named “Monster Cookies”, and based on all that goes into this cookie, that name is completely apt. This a total kitchen sink cookie, loaded with peanut butter, oatmeal, chocolate chips, butterscotch chips, and mini M&Ms (that was the ingredient I had to go shopping for – and why is it suddenly so hard to find mini M&Ms anywhere?? I had to buy some little snack tubes). After reading the intro to the recipe, I was really surprised to find out that these weren’t called “Monster Cookies” because of all the stuff in them. They’re actually called that because the bakery used to make ridiculously huge quantities of them. 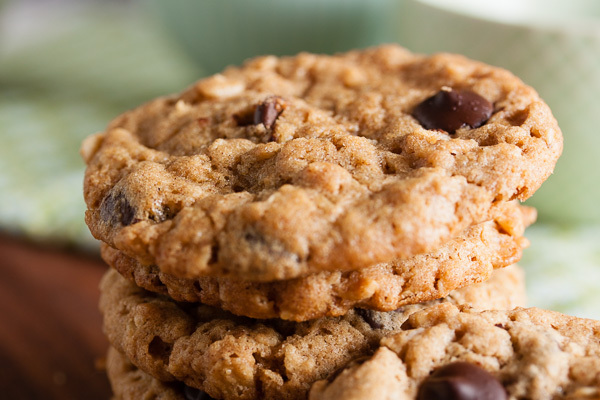 In addition to the quantity of ingredients they were working with, the original cookies were monster in size, using a whopping 1/4 cup of dough per cookie. That? That’s a monster cookie. But once again I made these much smaller than the recipe instructed – what’s that old saying, “know your audience”? Trust me, I know my coworkers. When people bring in big cookies, they just end up broken into smaller pieces because no one wants to take a whole one (but they have no problem taking 4 or 5 little ones!). I was really looking forward to finding out what these cookies tasted like. I learned recently that peanut butter and butterscotch chips? Taste fantastic together! 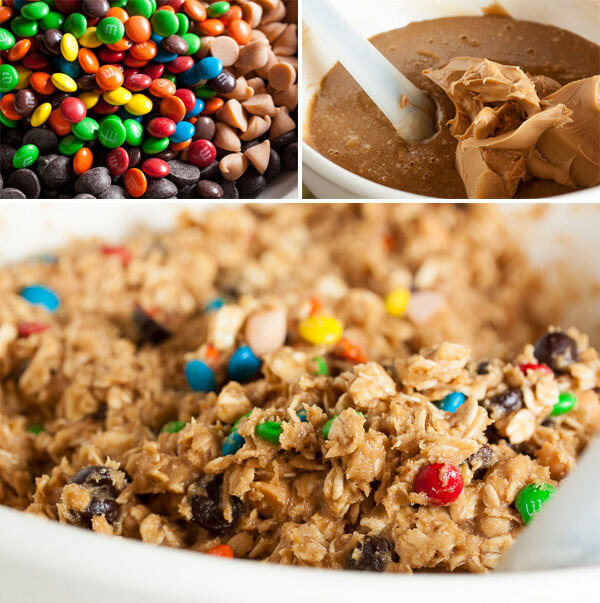 Adding oats and chocolate to that mixture sounds like an amazing combination of flavours. One thing I wasn’t sure about was the almost total lack of flour in this recipe. How on earth would they hold together? I’ll tell you how – melted butter and sugar and eggs. Baking never ceases to amaze me. Seriously, it’s like magic. You take this crazy collection of ingredients, smoosh them together, add heat, and suddenly – cookies! They actually puffed up a surprising amount as they baked (surprising because the batter was so dense with peanut butter and oats), and then flattened out again as they cooled. Resulting in a soft, moist, oh-so-chewy cookie. 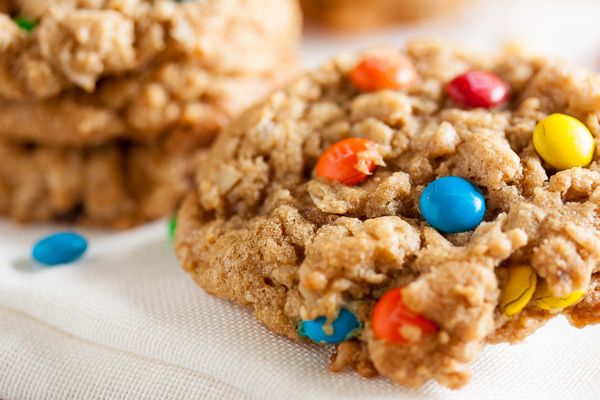 This is definitely a peanut butter oatmeal cookie at heart, with bursts of chocolate, butterscotch, and crunch from those mini M&Ms. My coworkers and I have decided that it’s a great breakfast cookie (what? it’s practically a bowl of oatmeal!). 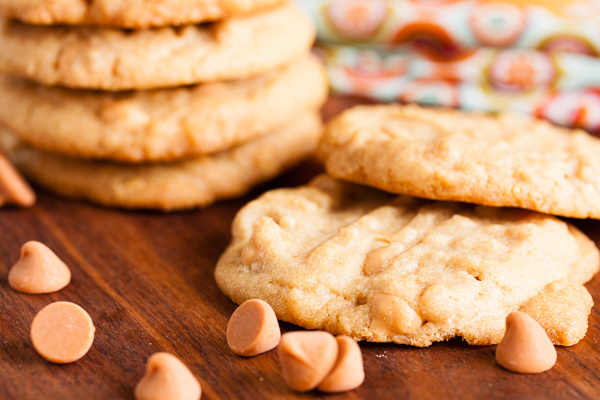 The recipe calls for crunchy peanut butter. I didn’t have any, so I used creamy. And honestly? Flavour-wise, of course, you’re getting all of the peanut butter flavour. But I think a bit more crunch would have been a good thing. Adapted from "Monster Cookies" from The King Arthur Flour Cookie Companion. The original recipe says it makes 26 large cookies. I got 88 cookies using my usual tablespoon-sized cookie scoop. Gently melt the butter, either in a microwave or on the stove over low heat. Set aside to cool. In a large mixing bowl, lightly beat the eggs. Add the brown sugar, white sugar, vanilla, corn syrup, baking soda, and salt, and stir together well. Stir in the melted butter, and then the peanut butter. Add the rolled oats and flour and stir again until just combined. 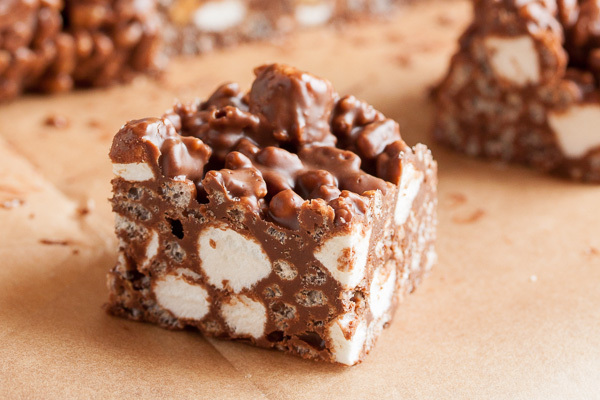 Add the chocolate chips, butterscotch chips, and mini M&Ms, either with a spatula or by hand. I prefer to knead inclusions in by hand to ensure they're distributed evenly. 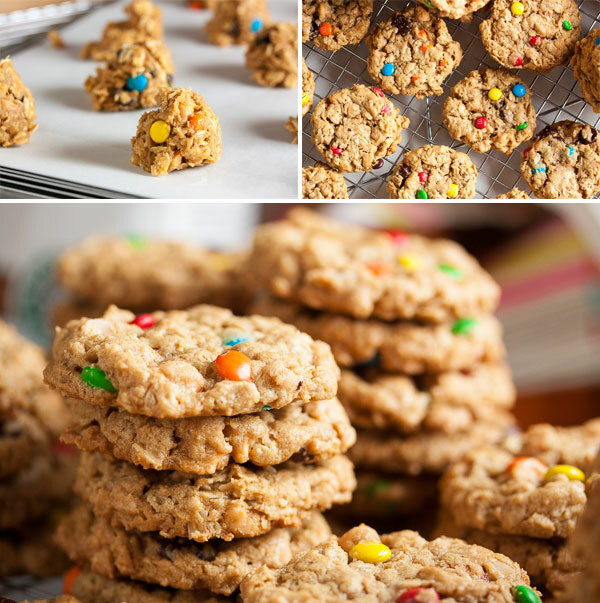 Using a small cookie dough scoop or a tablespoon (or a larger scoop if you want to make true "Monster" cookies), portion the dough onto the baking sheets about 2 inches apart to allow for spreading. Flatten the dough slightly with the palm of your hand. Bake for about 12 minutes, until lightly golden brown all over, rotating the baking sheet halfway through the baking time. Allow to cool on a wire rack for a few minutes before removing the cookies from the pan and allowing them to cool completely. These look super yummy. I love monster cookies because you can add tons of mix ins and it always comes together! Thanks Kathleen 🙂 Cookies like this are definitely a crowd-pleaser! I seriously love monster cookies, they definitely take me back to my childhood. Wish I had one of these to devour now!